Top: Ice-skater Yu-Na Kim, 2009 World Championships, © 2009 NBC Olympics. Middle: Segmentation result computed in 20 min. 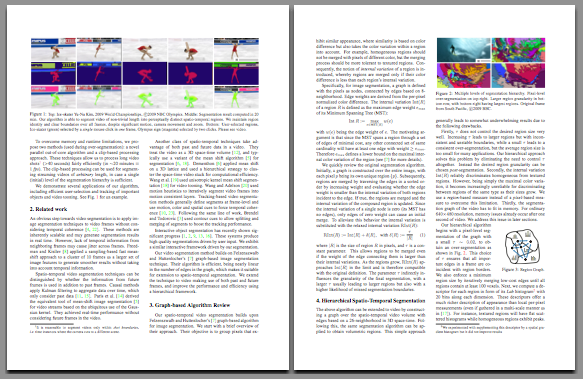 Our algorithm is able to segment video of non-trivial length into perceptually distinct spatio-temporal regions. We maintain region identity and clear boundaries over all frames, despite significant motion, camera movement and zoom. Bottom: User-selected regions, Ice-skater (green) selected by a single mouse click in one frame, Olympus sign (magenta) selected by two clicks. You can try out our video segmentation here. Our source code is available here. We present an efficient and scalable technique for spatio- temporal segmentation of long video sequences using a hierarchical graph-based algorithm. We begin by over- segmenting a volumetric video graph into space-time regions grouped by appearance. 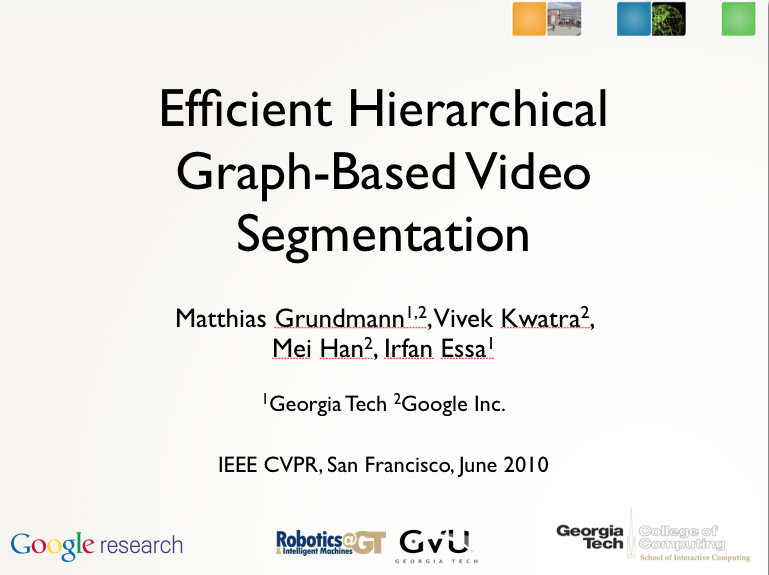 We then construct a "region graph” over the obtained segmentation and iteratively repeat this process over multiple levels to create a tree of spatio-temporal segmentations. This hierarchical approach generates high quality segmentations, which are temporally coherent with stable region boundaries, and allows subse- quent applications to choose from varying levels of granularity. We further improve segmentation quality by using dense optical flow to guide temporal connections in the initial graph. (b) a clip-based process- ing algorithm that divides the video into overlapping clips in time, and segments them successively while enforcing consistency. We demonstrate hierarchical segmentations on video shots as long as 40 seconds, and even support a streaming mode for arbitrarily long videos, albeit without the ability to process them hierarchically. Please request password by via e-mail. Just upload a video and obtain the segmentation results (videos and the actual segmentation). You can download the original videos used in our video and in paper. As most example videos are used under the fair-use clause for academic purposes, you need to aquire the password for the zip file by sending an e-mail.